If Google can figure out a system that works for everyone, with a pricing model that makes sense, that could be a serious game-changer for game-streaming services. Microsoft and Sony should be very, very worried about what comes next. Google lifted the lid on its huge gaming news in March 2019: its new game-streaming service, called Stadia. Since then, the world of tech and gaming has been torn about the service and whether it has true staying power. Some folks have said that game-streaming could be the great equalizer that finally breaks down the barriers held and enforced by the three main console makers, while others say game-streaming is far too new and niche to be embraced by mainstream gamers who wont' be content without the best PS4 games and Xbox One games. Opinions aside, there’s good reason to be both excited and skeptical about Google’s upcoming game-streaming service. That's because it holds the potential to both revolutionize the way we game, thanks to its tight integration with YouTube Gaming and lack of necessary hardware, or fail spectacularly in a similar way to OnLive. At this point, it’s anyone’s guess which way Stadia could go. If there are any data points to draw from here, however, it’s Google’s Project Stream beta, which it made available to the public back in November, and the new-and-improved Stadia demo it held at GDC 2019 that finally allowed us to go hands on with the service. What follows is our take on Google Stadia, its pros and cons, and potentially our hopes and dreams for the future of gaming. So, no pressure, right? Let’s quickly rewind. So Google lifted the lid on a new game-streaming service called Stadia at the Game Developers Conference that was held in San Francisco in March 2019. The service uses Google’s own servers to store and run games, which you can then connect to and play whenever you’d like on literally any screen in your house including your desktop, laptop, TV, phone and tablet. Basically, if it’s internet-connected and has access to Chrome, it can run Stadia. Games on the service are already in the their most up-to-date version – that means no waiting for a game to update and no need to wait for a game to install before you can start. Like watching a movie on Netflix or streaming a song on Spotify, it’s instantaneous streaming. Well, kind of. That said, we’re talking about a streaming service from one of the largest tech companies in the world. Google has server farms on almost every continent (sorry Australia and Africa, just not you) and these servers will play a key role in cutting down on latency to a level that gamers won’t notice. That’s also saying nothing of Google’s compression, transmission and processing algorithms that, theoretically, could enable 4K/60 streaming on bandwidths as low as 30Mbps. We’ll cover how the service acts in real-world tests in the next section, but before we do we should talk about how you’re going to discover new games to play on Google Stadia–because it’s radically different than any other service or console or platform in existence today. Primarily, how you’ll discover new games is via YouTube – either through your favorite streamers whom you can now join while they’re playing through a feature called Crowd Play, through a Google link to a friend’s game called State Share or via advertisements that let you play the game by clicking a link on a YouTube video. The goal here is to reach a point when you see a game on YouTube, you can instantly jump into that game on Stadia. It’s vastly different than anything we’ve seen before and could absolutely appeal to the next-generation of gamers who’ve grown up watching streamers on YouTube but could never play along with them. At this point you might be wondering what games you can play on Stadia. For now, the answer is Assassin’s Creed Odyssey and DOOM Eternal. End of sentence. 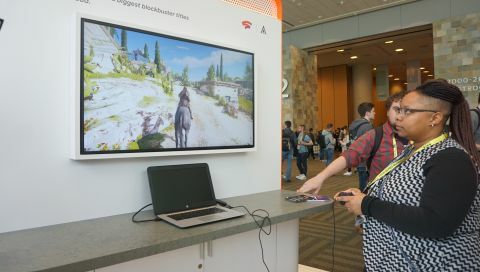 But that’s why Google very carefully picked the Game Developers Conference as its launch pad for Stadia – so it can recruit developers to fill up the library without emptying its coffers for streaming rights. To that end, most of the Google reps we spoke to said there isn’t much more to say about which games you’re likely to see on service as of right now, and that all of us would just have to wait to see which games would be announced at an event held later this year. While we wait for Google to announce more partners, we have at least one solid piece of compatible hardware to whet our appetite in the form of the Stadia Controller. You won’t necessarily need this piece of plastic – or any other for that matter – to play Stadia games, but the controller does make the most of the platform Google is building. The key features for folks who don’t have time to read through our full Stadia Controller first look piece, are the ability to use the dedicated Google Assistant button as a sort of sherpa while you’re in-game to provide you guides and walkthroughs, and the Share button that gets Google to send an identical second stream of your game to YouTube in 4K resolution which you can watch later, share with your friends or share with the YouTube Gaming community. Because the controller is more of a value-added component rather than an essential accessory, Stadia doesn’t require any additional hardware to play – it will work with whatever controller you have laying around on your PC or you can always default to using your keyboard and mouse if that’s the play style that you prefer… not that we were given much of a choice at our demo. The only game available for demo was Assassin’s Creed Odyssey, the same one Google used to test the service when it was revealed back in beta in November. The experience was markedly better than we remember it with less compression and fewer dropped frames. There was, however, the slightest bit of latency in the connection, though that could’ve simply been due to the busy network that everyone was connected to. What’s crazy to us, is that if you had blindfolded the average gamer and brought them to the booth without telling them the game was being run on a server miles and miles away from the convention center, they likely wouldn’t have believed you. All they would’ve seen is a nearly new game from 2018 running on Ultra High settings at 1080p/60 frames per second. They might have raised an eyebrow at the one or two times Stadia dropped a few frames, but even that could happen to consoles and PCs when performing under load. It’s just really that good. And that was just at 1080p/60. According to Google, DOOM Eternal can hit 4K/60 with HDR, and the service has the bandwidth to go all the way up to 4K/120 and even 8K/60. Because everything is being run on high-end cloud servers that can be upgraded at Google’s whim, the only limitation to Google’s game-streaming service is the display you’re playing on. Of course it's very easy to sit here and criticize what the streaming service might have to offer, as well as the cases where it won't perform as well as Google expects. But, on the flipside, it's also easy to be upbeat without knowing enough about Google's business model, the service's costs, the games it'll have on offer and how well it'll work outside of a convention center that no doubt has a blistering network speed. With that in mind, we’ll leave you on a note that’s both optimistic and skeptical in equal measure: If Google can figure out a system that works for everyone, with a pricing model that makes sense, then Stadia could be a serious game-changer for game-streaming services. Microsoft and Sony should be very, very worried about what comes next. Stadia is expected to launch in the US, Canada, UK and most of Europe later in 2019.